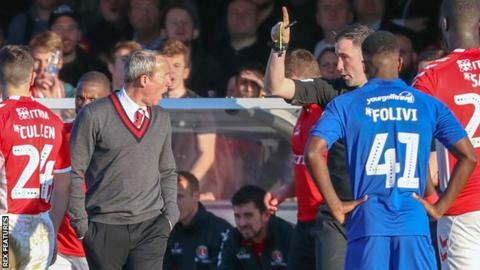 Charlton manager Lee Bowyer has been banned from the touchline for three matches after being found guilty of verbally abusing a referee. Bowyer, 42, was sent off by referee Chris Kavanagh for using "abusive and/or insulting language" in Saturday's League One game at AFC Wimbledon, which the Addicks won 2-1. He was also found guilty of the same offence after he was sent off. Bowyer will miss Charlton's games with Doncaster, Portsmouth and Burton. A Football Association statement said Bowyer used "abusive and/or insulting language towards the match referee in both the 46th minute of the game and following his dismissal". The former Leeds, Newcastle and England midfielder has also been fined £1,750.